About two-thirds into our dinner, just after we’d finished our main courses, my dining companion (she wants to be know as The Brunette but obviously that’s not going to happen) popped out for a quick cigarette. 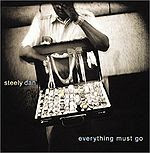 She came back saying the bistro of The Eastside Inn looked a lot more appealing: more fun and the food simpler. She had a point. On our side of the tracks everything was all a bit, uh, beige. In Britain some of the best food and most enjoyable experiences are now to be had in pubs and bistros. In this new restaurant world order the Eastside Inn – well the fine dining side at least - seems a bit of an anomaly, a throwback. All the old tropes of high-end dining are present and correct here: the décor understated and snooze-inducing; the service a bit stiff and uninvolving; the tiresome attempt to get you to buy Champagne; the enthusiastic overfilling of wine glasses with the bottle placed out of reach. 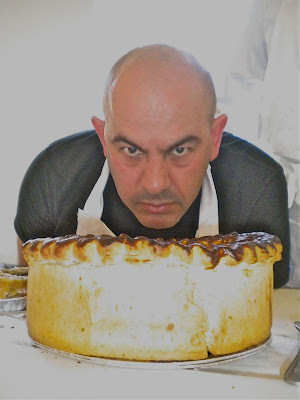 There are endless amuses and pre-desserts which could be interpreted as generosity – they’re all included in the £45 prix fixe menu – but after nearly three hours at the dining table seemed more like cruel and unusual punishment. Some of these problems could and should be eliminated over time. 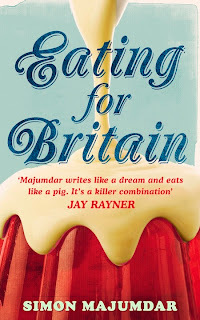 More problematic was the food itself which in several instances was muddled in concept and execution. 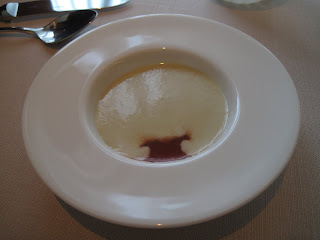 Of the amuse bouches the best was a refreshing red gazpacho that had what I took to be ajo blanco ladled on top. A nice palate enlivener. 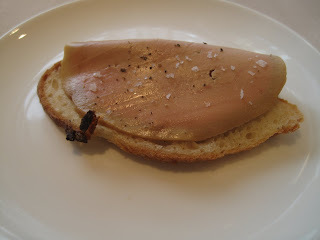 Of the other two a thin sliver of foie gras was good (as foie gras often is) but very salty. 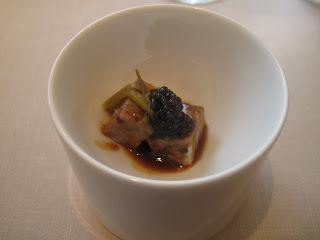 A small cube of head cheese came with a blob of caviar and was a bit cold but okay. No bread was offered which is a bit odd in any level of restaurant these days. 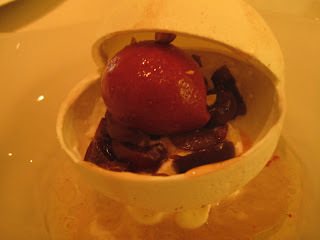 Our old high-end chum Mr Foam made an appearance in a Foie Gras starter. It’s interesting how coffee can work well in savoury dishes and here in the form of an espresso syrup it combined well with the liver. 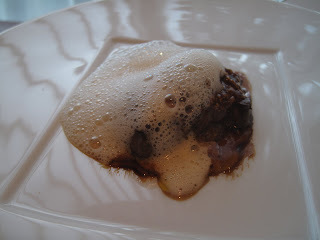 The Foie could have done with a little more cooking - it was that side of softness that gave it a sloppy, unpleasant texture – and the foam covered most of the dish making it look like someone’s morning cappuccino. 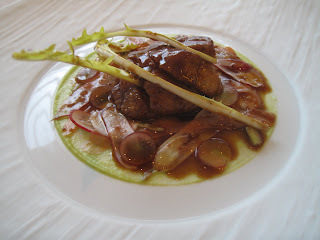 Braised Veal Sweetbreads were a big disappointment. Sweetbreads when cooked properly should be have a creamy, melting texture within. These were overcooked – sautéing them may have been the better treatment. The dandelion would have worked better if the whole didn’t come drowned in one of those unsubtle sauces that coated your mouth and killed the taste of everything else. It’s at times like these that it would be good to be able to jettison out of a meal. Given what we’d had already eaten I could, by extrapolation, work out what was to come and it didn’t look so appealing. 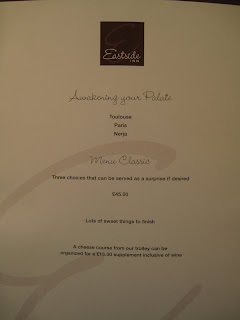 There were good elements to our main courses. 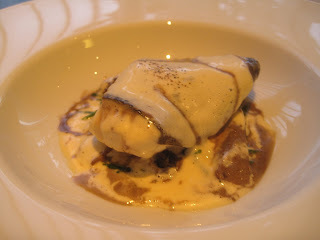 The Brunette’s (damn) Turbot was a decent tranche of fish cooked very well, but, and I know it was billed as a blanquette, it was overwhelmed by the cream sauce. The limp skin had been draped unappealingly over the flesh with some more nappage in evidence. Fish by itself, fine. Sauce by itself, fine. Together, not so great. 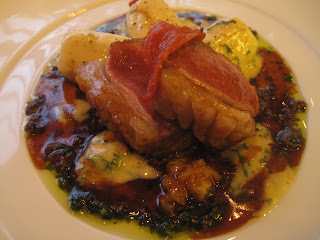 Similarly, my Salt Marsh Lamb was very good, as were the Gnocchi but the sauces were all over the shop. The tapenade would have been enough. 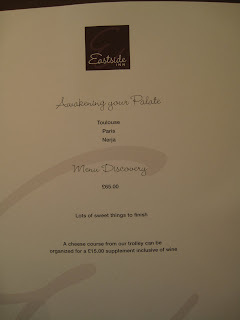 Funnily, enough I can remember an excruciatingly bad curry sauce I’d had with lamb at La Noisette. It seems that Mr van der Horst has, as we say “form” in this area. Someone should call the Sauce Police. The Cheese trolley rolled up and The Brunette says yes please. Not so clever later on when she realises it carries a £15 supplement although this did include a couple of half glasses of wine (a Juracon and a Vin Jaune). 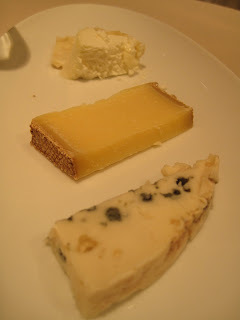 Roquefort, an Irish Goats cheese and one similar to a Comte were in good condition but why not more choice ? I also got to taste the bread which disappointingly was not made in-house but brought in from, to quote the waiter, a big French bakery in North London. No, me neither. We were both visibly wilting by now and The Brunette wanted to leave but dammit we were going to see this thing through to the end. Several of the desserts had that quality which reminded me of the Johnson quote about women preaching. 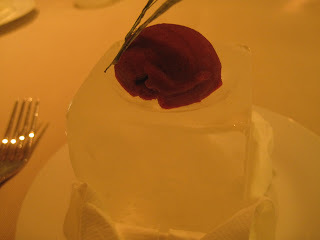 Exhibit A in this category was a small blob of sorbet tasting mostly of a herb, whose name escapes me for the moment, which was presented on a big block of ice. 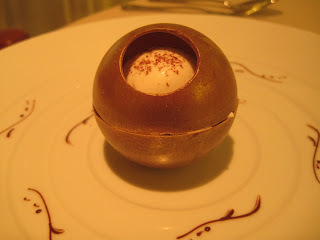 The two Orbs which comprised the main dessert (no choice apart from Gold or White Orb) were presumably supposed to elicit ooohs and ahhhs but arriving when they did only invoked inward groans not least from one of the waiters who burnt herself lighting one of them. That’ll be the Vacherin Flambée then. 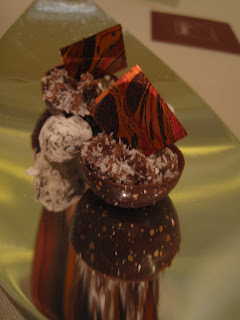 They at least had the benefit of not being over sweet and were relatively light in texture. Likewise, the PFs which were pretty good. Several years ago Nico Landenis and MPW handed back their Michelin stars and decided that the future of restaurants lay in a less formal, more casual dining experience. Time will tell as to whether I’m the only person in EC1 to concur and wonder at how prescient this now seems ? That's a shame. If I remember correctly, it's such a pleasant pub (open spaced, old fashioned wall paper?). Never date a bruneete or whatever that (a)smokes or (b)orders stuff that is clearly indicated as having an extra charge! In any event,why exactly do people order cheese in a restaurant-the chef didn't make it,it's just bought in and then hugely marked -up?Cheese tells you nothing about the chef's ability to cook-only about their supplier;ability to store;and sell to chumps at a huge mark-up. Dump the brunette -she fails 2 out of the 3 tests on "dinner with a date at a restaurant". Are you sure she went out for a fag?or was she in a snit because the restaurant directed all their comments on the dishes to you? 'Our old high-end friend Mr Foam': really nicely put. Sorry to hear you didn't enjoy it. I think the chef once got loads of michelin stars at "the greenhouse" or is that a different guy? The grass always looks greener on the other side!I ate in the bistro part,which was very hot,noisy,and uncomfortable(the cooking takes place in this open plan space)and we pined for what seemed to be the cooler,quieter,more sophisticated and certainly more comfortable high dining part which we could glimpse through the cooking steam! The business card of the chef shows his/her name as... Justine van der Horst,although(dare I say it?) 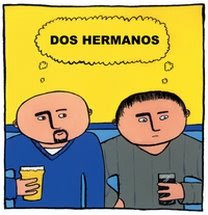 he(?) did look like a chap. Maybe he has been Bjorn again? Wife and co-owner I believe. Hi Melanie - have you commented on the right post ? Mike - Why is it I get the feeling you don't get out much ? B.Huston - I think he got one at La Noisette. Not sure about The Greenhouse. Am a great fan of your blog and (generally) agree with your absolutely spot on analysis/reviews. But (sorry, there is always a but) I do think that you have been too harsh with Eastside Inn. Being a local, the reincarnation of Vic Naylor has always been an interest and Bjorn van der Horst & wife have taken a long time to open. I agree that it isn't perfect but sometimes, particularly in these economically challenged times, the pleasure of being closeted, taken care of and pampered cannot be estimated. I can see the virtue of cheap cooking eg bavette, belly of pork etc - but I like my amuse, in betweens, afters and petit fours. And I think Eastside delivers that. It is the complete opposite end of the restaurant spectre from the likes of oh, Arbutus (in terms of price), and St John (in terms of simplicity) but it's no bad thing. Especially in this neck of the woods. 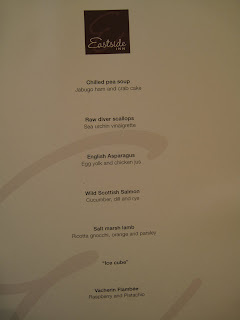 So, sorry about this rant and rave - but our meal was rather superb (same amuse as you had, lobster with butter sauce for my other half, foie gras with Mr Foam and bits for me, turbot - which was excellant, and the two puddings). I do agree that the pudds were a bit pedestrian (what's with the dome thing) but the service was a million times better than first week of Hix and overall, the whole package delivered. 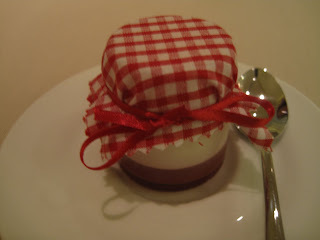 (PS I think - but am not sure - that the sorbet thing was beetroot and tarragon). Firstly, thanks for the comments about the blog - always happy to hear that somebody likes our ramblings (or should that be my ramblings as HS writes with a lot more clarity). 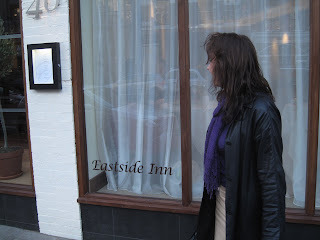 Secondly, I have to disagree with you about The Eastside Inn - I found the whole experience there very dull. 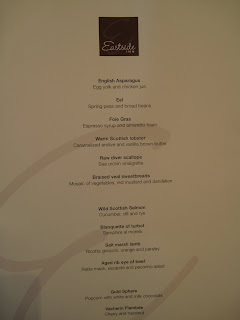 I have nothing against high-end dining per se (see what I did there) or event the length of a meal as shown by my recent-ish post about the The Ledbury although I'm finding the combination of fantastic chefs in modest surrounding a very potent and winning combination e.g. The Red Lion, The Sportsman etc. I've also been known to spend the greater part of many an afternoon at Anthony's in Leeds. The point is, if you're going to do the fine dining shtick you need to have a few wow moments and this place didn't deliver any. You don't get a top restaurant just by chucking in a few luxury ingredients - the concept and the execution have to be spot on and it just wasn't here. I didn't even find it a particularly relaxing environment: the chairs were uncomfortable (though that may have been down to my lardy derriere), the decor snoozeworthy and the service less than it should have been - the overenthusiastic wine pouring was very annoying. I didn't even mention the intrusive music which is usually a particular bugbear of mine. This is obviously a labour of love for Mr van der Horst and his wife (as it damn well should be) and I wish them well, but it just didn't float my boat and I said so. Sorry. Do you think that horrible spitty foam might eventually go out of fashion? 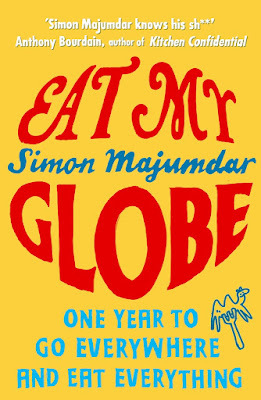 I simply can't take the chance of having spit all over my food, so it is long time since I have braved the top end restaurants that seem to favour that type of saucing. Have the DH ever written up a good middle eastern(lebanese?) restaurant,I've tried going thru yr posts,but can't find anything recent,and i wanted to go with friends?Are they all awaful-is that why you haven't written anything? JEAN GEORGES: DID YOU ENJOY YOUR MEAL, SIR?